We organize tours to the cultural places such as Essouira, Telouet and Aït Ben Adou. We also propose excursions in the Waterfalls of Ouzoud, the Valley of Ourika and trekkings in the south of Morocco . You can ride quads, bikes, buggy, horse, camel throughout the Saharan desert, or simply enjoy the journey driving an air conditioned SUV. Another way to explore this mystic place is sightseeing in an hot air balloon. At night, the weather in Marrakesh gets cooler. You can join our groups to enjoy the city by night at restaurants or nightclubs. Enjoying your holidays in Marrakesh is at the same time a discovery of the Moroccan cultural world, the guarantee of sunny days and the pleasure of a stay in an international city open to the world. You can live in Marrakesh in an european way as some people have already experienced it. The most exciting experience is losing your way through the busy and colored Medina. 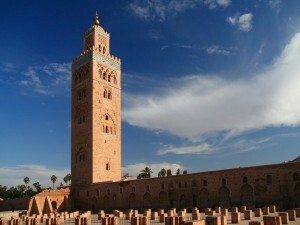 Not only dedicated to museums and gardens, Marrakesh offers also many shopping facilities . At night, shows and exhibitions make the area becoming a party place. 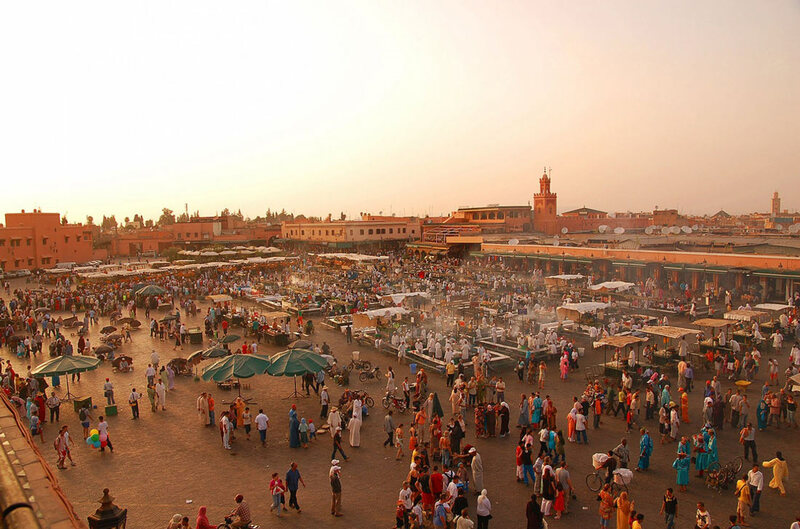 Marrakech is situated on the spur of the Atlas Mountains. It is also close to the Valley of Ourika and the desert. A masterchief Spanish – Moresque architecture of 12th century that inspired the construction of the minaret of Seville. 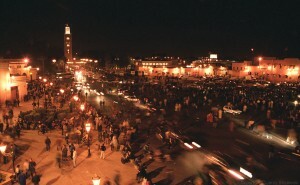 The Jemaa el Fna square, with its irregular shape, is classified by UNESCO as a Heritage of Humanity. Formely a show-stage of public execution, it is nowadays a meeting place for all merchants, fortune tellers, snake charmers, musicians, singers, acrobats, painters of Henna. There are fruit juice sellers and stalls where you can taste grills, snails, and so on. There you can meet either foreign tourists or marrachkis who come to enjoy the views from the panoramic terraces of the various coffee shops. The meaning of the Arabic word « Bahia » is « Beautiful ». This Palace was built during the late XIXth century, in 1880, by the Vizier Ben Moussa in order to honor his favorite wife. The quality of the Moresque style decorations and the beauties of its garden of orange trees make this Palace a highlight tourist place to visit in Marrakesh. There you can admire floors covered with zelliges, panels of stucco, painted ceilings, wooden doors richly decorated, and other fresh flowered patio. The souk is the main socialisation place in the life of each marrachkis. It is a great bazar with a fabulous and unique atmosphere made of a blend of smells and colors. The most exciting experience that you can get is bargaining with the merchants or getting lost in this labyrinth of shops and groceries.